Republican Texas Sen. John Cornyn said Sen. Specter (top) changed parties for "political preservation." 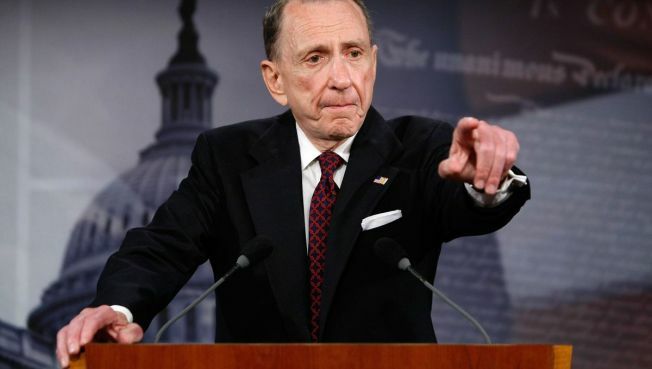 Senate Republican leaders are pushing back hard against the notion that their party is to blame for Arlen Specter’s defection to the Democrats. "This is not a national story. It is a Pennsylvania story," Senate Minority Leader Mitch McConnell told reporters in a news conference following Tuesday’s GOP policy luncheon. Two leading Senate GOP moderates said earlier in the day Tuesday that Specter’s decision underscored the hostility Republican centrists feel in a party that’s increasingly conservative. Maine Sen. Olympia Snowe said that the GOP hasn’t been offering “warm encouraging words” about moderates. South Carolina Sen. Lindsay Graham suggested that the Republican Party risked becoming little more than the Club for Growth. “I want to be a member of a vibrant national Republican party that can attract people from all corners of the country — and we can govern the country from a center-right perspective,” he said. McConnell said Specter told him of his decision late Monday, and that Specter had said he decided to make the switch because he couldn't win reelection as a Republican or an Independent. But McConnell said the pressure would now be on moderate Democrats from conservative states who, he explained, would have to decide whether to vote with their party leaders to sustain the 60-vote bloc. "I think there will be more pressure on Red State democrats who ran as moderates to actually vote as moderates," he said. McConnell also said that Democrats won’t be able to count on Specter as an automatic vote in their corner. Specter assured him, he said, that he still opposed the Employee Free Choice Act.